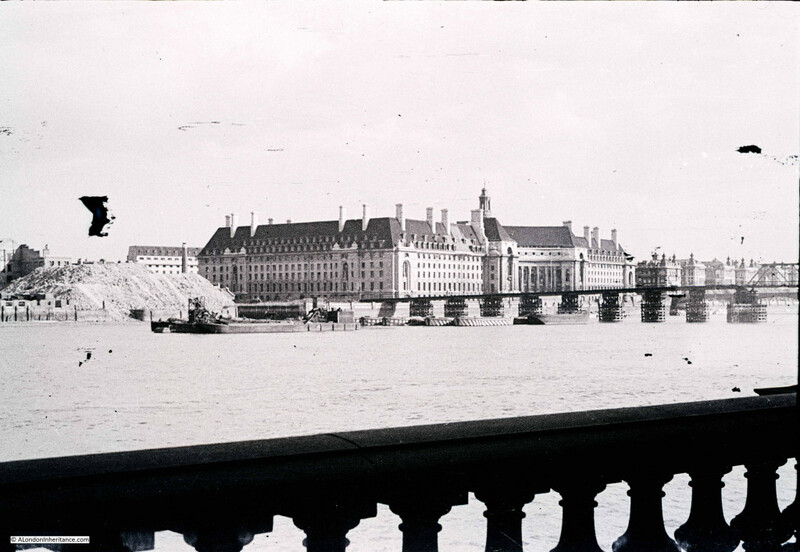 My father took the following photo in early 1947 from the Embankment, just by the base of the Hungerford railway bridge looking over towards the County Hall, the offices of the London County Council. The photo is from the end of a strip of negatives that has suffered some damage. I will process and repair, but for this blog my intention is to present my father’s photos as I first see them after scanning. 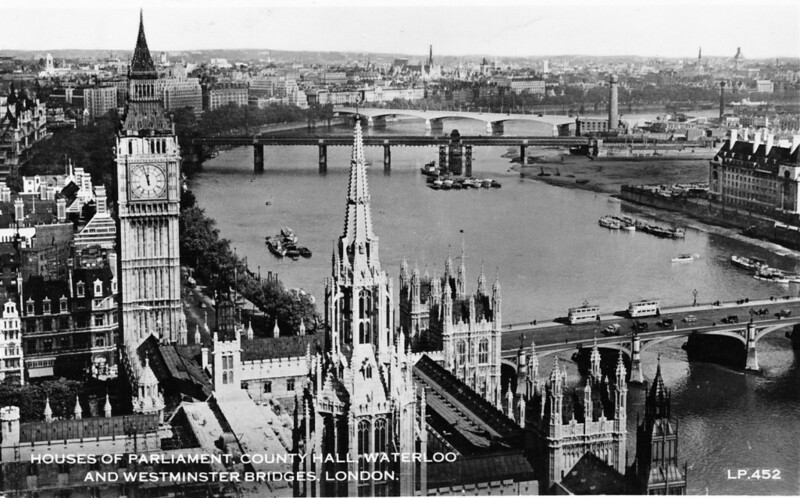 The photo is interesting for two features, the temporary bridge over the Thames that can be seen running across the river in front of County Hall, and the large heap of rubble to the left of County Hall. The very start of demolition of the site that would a few years later be the location of the Dome of Discovery for the Festival of Britain. The location where my father took the photo was easy to find. As well as County Hall being the main feature in the photo, the balustrade in the foreground is still there. Just beyond County Hall to the right are the original buildings of St. Thomas’ Hospital. Unfortunately the weather was not as sunny as when my father took the photo 68 years earlier, however my 2015 photo from the same location: The ship in the foreground was not there in 1947. She is the Hispaniola, launched in 1953 as the Maid of Ashton and entered service in Scotland. She was converted into a restaurant ship and renamed the Hispaniola in 1973, finally reaching her current place on the Thames in 1974. The temporary bridge over the Thames was one of a number constructed during the war. The aim was to provide an alternative route over the river if the main bridges were bombed. 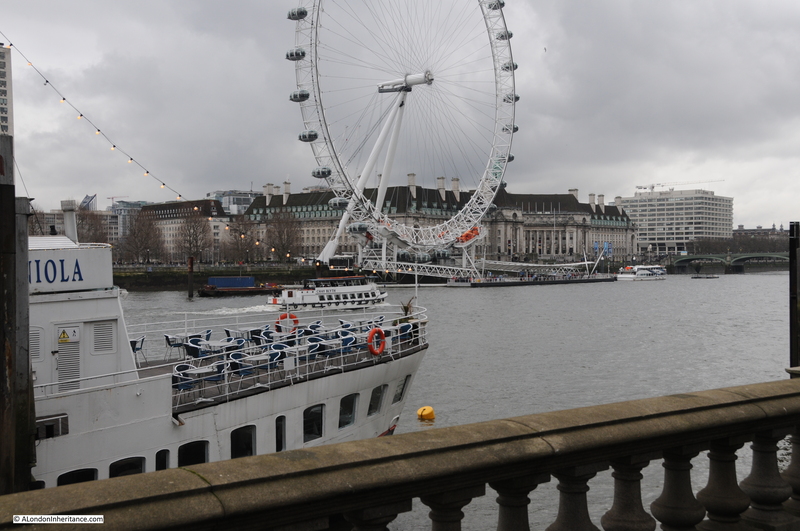 This bridge would have provided an alternative route if the nearby Westminster Bridge was hit. The temporary bridges were removed between 1947 and 1948 so my father’s photo was taken a couple of months before it was dismantled. The route of the temporary bridge was from the north bank to the south, to land adjacent to the County Hall. The following photo is from the landing point on the north bank looking along the line of the bridge to the south bank. These bridges were temporary and there is no evidence of the bridge to be found today, just the London Eye which now dominates this area of the south bank. There was a second photo on the same strip of negatives, in better condition, and taken looking slightly to the left of the first photo so we get a full view of the location that would host the Festival of Britain and which is now the Jubilee Gardens. As with so much of the land along the banks of the river, the stretch between Hungerford and Westminster bridges was a continuous stretch of warehousing and industrial activity with many wharfs and inlets to the river. Looking across to the same area now: To give some idea of the activities which took place along this stretch of the river, the plans for County Hall detail the occupiers of the site prior to the start of the construction. Adjacent to Westminster Bridge was the Westminster Flour Mills, then came the Lambeth Borough Council Works department with Acre Wharf and Vestry Wharf on either side followed by the Cross and Blackwell factory at Soho Wharf, then extending past the County Hall site was the London County Council Works Department. 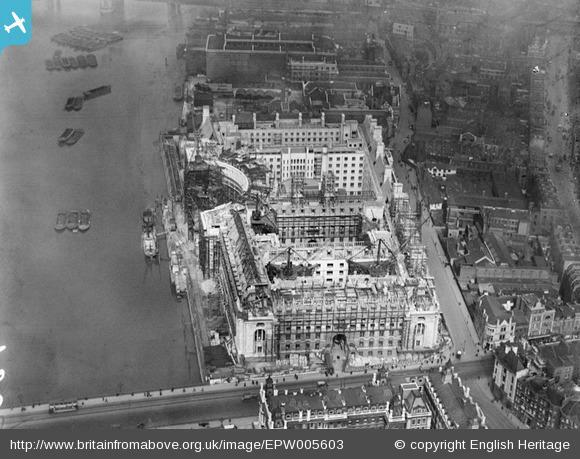 The whole stretch providing a very irregular frontage onto the Thames, as shown in the 1947 photos. 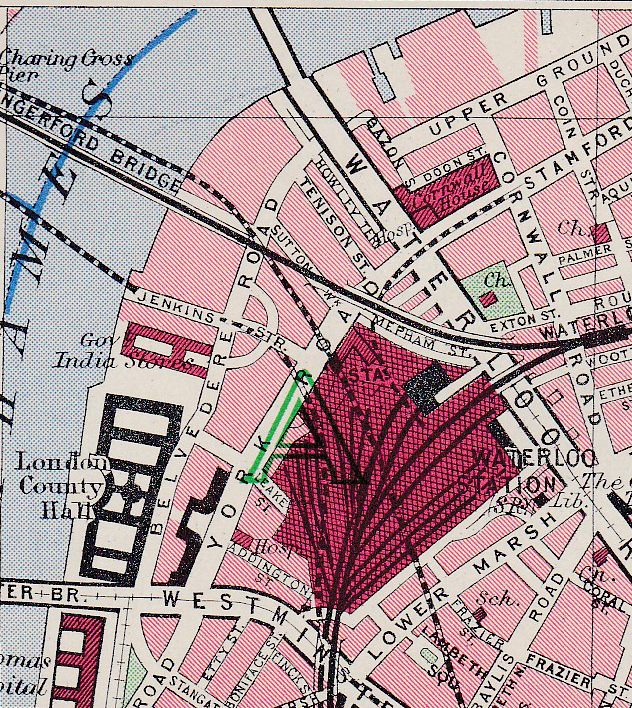 The following map is from Bartholomew’s Reference Atlas of Greater London from 1940. Whilst not showing the wharfs, it does show the area adjacent to County Hall, covered by my father’s original photos, part occupied by the Government India Stores and that a road, Jenkins Street, now long since disappeared extended down to the river’s edge from Belvedere Road. Construction of County Hall commenced in 1909 with a “coffer dam” being built between January and September 1909 to separate the construction area from the Thames so this could be emptied of water. Work was then started on the embankment wall in September 1909 to build the substantial wall that we see today. Once the area was separated from the Thames, construction of the foundations and the raft on which the building would sit started. It was during this work that evidence of London’s Roman history was found with the discovery of a Roman boat deep in the sub soil, 19 feet below the river’s high water level. 38 feet in length and 18 feet wide the boat was considered to be a “round-bottomed ocean-going” boat. 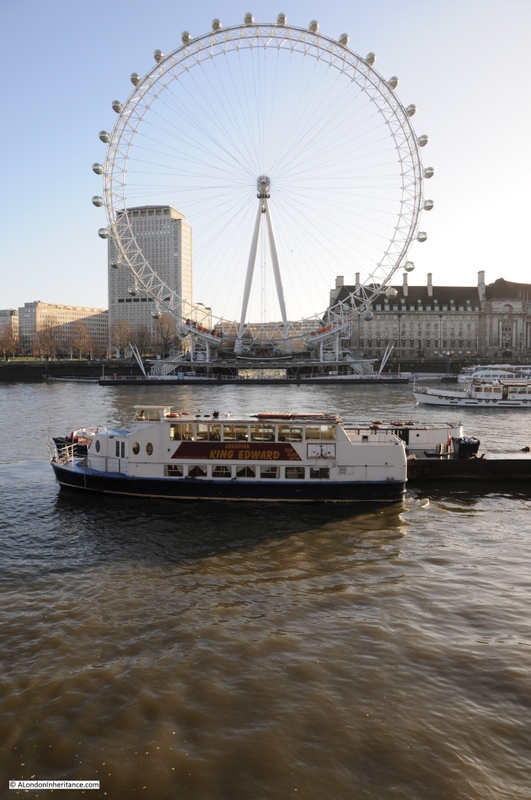 After seeing the light of day and a very different Thames than the boat must have last sailed down, it was stored by the London County Council before being transferred to the Museum of London. Work continued on County Hall during the First World War, initial impact of the war was on the slowing of supplies of Cornish granite due to the military demand for rail transport. Reduction of supplies resulted in manpower being moved onto other activities with work slowing considerably after 1915. After the war, work picked up again, with 349 men working on the site in July 1919 rising to over one thousand in 1921. County Hall was finally finished and officially opened in July 1922. The following postcard with a view taken from the Victoria Tower of the Houses of Parliament shows the area of my father’s photo following clearance and before construction of the Festival of Britain. This must have been around 1949. the temporary bridge has been removed along with all the buildings and rubble from the south bank site, with the land flattened all the way down to the river. It must have been a sight at high tide with the river probably able to extend a fair distance inland at this point. The view from the Victoria Tower also shows how few tall buildings there were across London. An aspect of the city that would change very dramatically over the following 60 years. 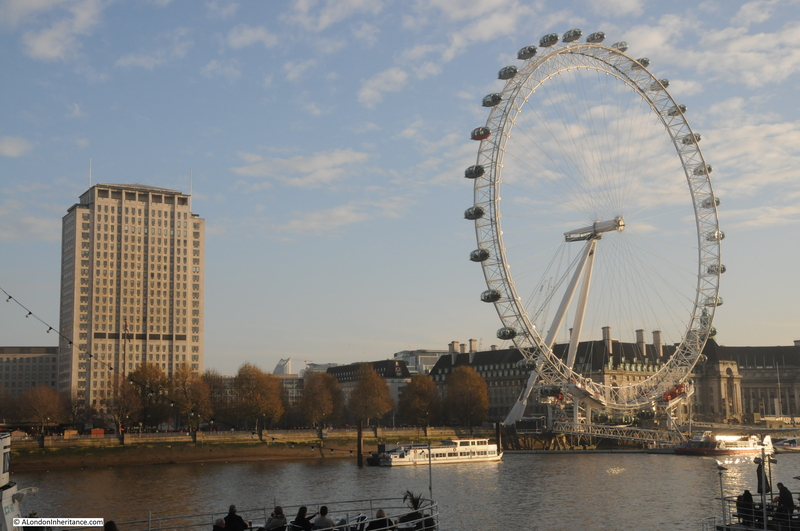 This entry was posted in London Buildings, The Thames and tagged County Hall, London County Council, River Thames, South Bank on March 15, 2015 by admin. I think I know London, but then I read your posts and find out so much more! The temporary bridges were new to me, were they ever used? A great read. Hi Donna, yes they were used in parallel to the main bridges which surprisingly suffered no real damage so the temporary bridges did not take on the full role. They were a good example of some of the planning that went on with the intention of keeping London moving. Did this temporary bridge (between Westminster Bridge and Hungerford Bridge) have a name? The previous Waterloo bridge suffered subsidence and closed in 1934, and its replacement was under construction for most of the war. I think there was a temporary bridge in the meanwhile (presumably a different bridge to this one?). When the new bridge opened in about 1942-3, the temporary one was dismantled and reused in liberated Europe. So that is three or four. Were there many others? Andrew, I am not aware that the temporary bridges had any names. As you say, there was a temporary bridge due to the problems with Waterloo Bridge. It was dismantled in November 1943, placed in storage then used to bridge the Rhine at Remagen. I have a photo that my father took of the bridge between Albert and Chelsea bridges in the process of being dismantled. I am checking through all the negatives to see if he also took photos of the others. I believe there were five in total with three being in central London, however I have not yet been able to trace them all. The film “Night and the City” has its ending chase scene filmed on the derelict land next to County Hall and near the shot tower. Richard Widmark runs up Howland Terrace. Filmed in1949/50 the Festival of Britain site was being cleared at the time. Love your dad’s photos. Andrew: thanks for pointing these out. I have looked through many of the photos on the excellent Britain from Above, but have not seen these. The Waterloo photo is really good, shows a considerable amount of cross river construction. You may be interested in my Flickr post regarding the emergency bridges and the links attached. 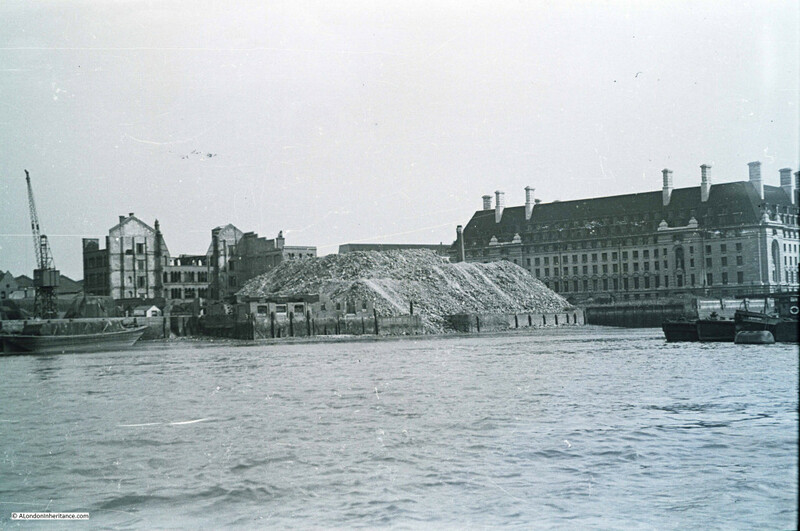 Thanks Leonard – that is a really good view of the bridge at Westminster and the very large heap of rubble on the south bank. Fascinating collection of photos. Just found this today. Two of pictures show the bailey Bridge. First I knew of it. Thanks for the link, that is a good clear photo of the bridge and shows clearly the route of the bridge over the river.